Home The NewsMill Scraping Art 35-A will sever JK’s relation with Indian Union forever: Mehbooba. Scraping Art 35-A will sever JK’s relation with Indian Union forever: Mehbooba. 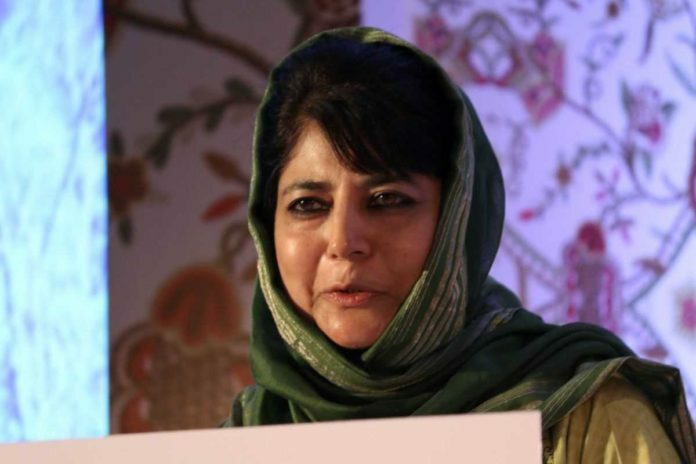 Peoples Democratic Party (PDP) President and former chief minister Mehbooba Mufti Tuesday castigated the rightwing Bharatiya Janata Party (BJP) chief Amit Shah over his anti Kashmir remarks, stating that any fiddling with Article 35-A would turn the situation in Jammu Kashmir apocalyptic and impossible to handle. Addressing PDP worker’s in north Kashmir’s Handwara, Mehbooba termed it unfortunate that BJP was trying to reap electoral benefits out of Kashmir situation and trying to tell its followers that by prosecuting, ridiculing and harassing Kashmiris, they were actually avenging thousand-years-old Muslim rule in India. She said BJP and its ilk should know that since 1947, Article 35-A had been acting as a bridge between the State and rest of India and if any damage was caused to this bridge, it would quash the very agreement on the basis of which Jammu Kashmir acceded with India. “Even we the mainstream parties who swear by the constitution of the country and of the State will have to rethink which way should we adopt. You will not find anyone to shoulder the tricolour. Even we, the mainstream political groups, will not be able to shoulder the national flag in Jammu Kashmir,” Mehbooba said. She said Jammu Kashmir secured its unique position and same could not in any way be contested in any court of law. “Article 35-A is a matter of life and death for us. No one has the authority to challenge the very identity of people of the State in any court across the world. This sword cannot dangle over our heads all the time,” Mehbooba said. The PDP President said those launching assaults on state’s integrity on multiple fronts should not live with the notion that they could any longer terrify people of Kashmir with such tactics. “Article 35-A is part of Article 370 which confers certain rights to the citizens of the State. By launching assault on Article 35-A, attempts are being made to change the Muslim-majority character of Jammu Kashmir,” Mehbooba said. She said those who demand Jammu Kashmir’s special status should be scrapped must understand that the relation between Jammu Kashmir and India is based on Article 370. If this special status is scarped, it will nullify the legitimacy of accession of J&K with the Indian Union, Mehbooba said. Speaking on the occasion, senior PDP leader Mehboob Beg reminded NC Vice President Omar Abdullah how his grandfather traded the position of State’s own PM with the CM and now the grandson was seeking votes to undo the same. Previous articleForces launch CASO in Shopian village. Next articleKangan shuts on youth’s death anniversary.